Trading volume was light Tuesday as gold and platinum declined. Silver was near flat and palladium edged up. Gold futures settled lower Tuesday for the first time in three sessions, sliding from a two-week high in lightened trading activity. Gold for February delivery shed $6.50, or 0.6%, to close at $1,074.10 an ounce on the Comex division of the New York Mercantile Exchange. "When you get close to the end of the year, liquidity is getting smaller and people start closing the trades they have had for the year," Reuters quoted ABN Amro analyst Georgette Boele. "One of them was short euro, long dollar, short gold." 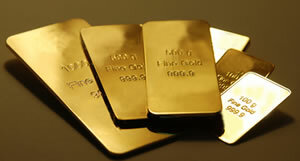 Gold prices ranged from a low of $1,073.60 to a high of $1,080.30. They advanced 1.5% in starting the week when they closed Monday at their highest point since Dec. 4. Silver for March delivery was near unchanged, dropping one-tenth of a penny to settle at $14.314 an ounce. Silver prices traded between $14.22 and $14.40. They jumped 1.6% in the prior session to close at their best level since Dec. 7. January platinum declined $8.30, or 0.9%, to $873 an ounce, ranging from $870.60 to $880.20. Palladium for March delivery added $1.25, or 0.2%, to $554.65 an ounce, trading between $550 and $559.10. Gold declined $3.85, or 0.4%, to $1,074.90 an ounce. Silver added 4 cents, or 0.3%, to $14.24 an ounce. United States Mint bullion sales were unchanged as of 3:17 p.m. ET. Expect only modest coin gains in the next few weeks with 2015 sellouts in the most popular American Gold Eagles and all silver coins. New 2016-dated bullion coins launch on Jan. 11.